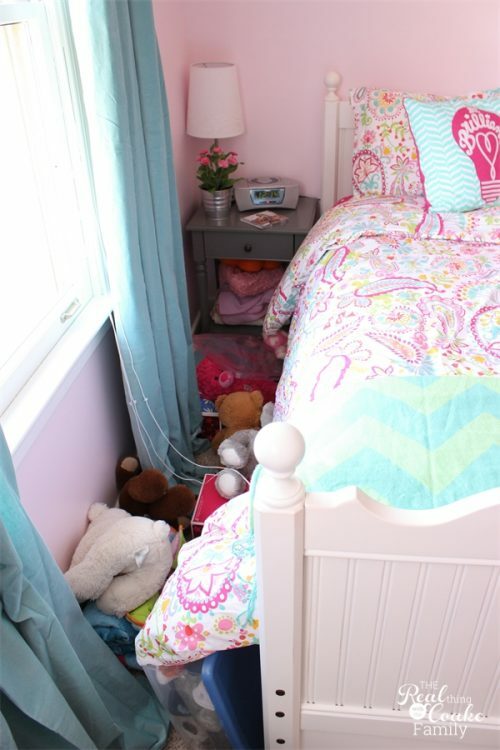 Have you priced bed skirts lately? I'm admittedly cheap or on a tight budget…whichever we want to go with and yet I can't believe what bed skirts can cost. I might possibly have found something and made it work for my daughter's new room, however a traditional bed skirt will not fit on her bed. I had to come up with how to make one and in the process I saved a lot of money. Yay for that! It was last March that we moved our girls into their own rooms. Up to that point, they had shared a room for a long time. Almost a year later, we have begun decorating their rooms…yeah, we are quick like that. LOL! No, I was working on our living room, then had to save up for their rooms. We painted her room a softer shade of pink, added new curtains and blinds, gotten new bedding and a new night stand, gotten a pink rug, and moved things around. We still have a ways to go, but we are making progress. I've been working with Offray ribbon for a few months now and my daughter really wanted me to include some of their ribbon into her room. 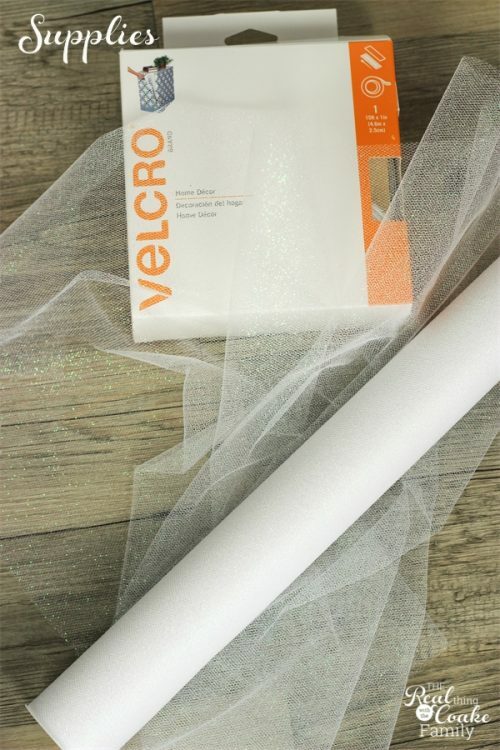 Offray gladly sent me the tulle I needed for this project as well as sponsored this post. As always, all opinions and experiences are 100% real and my own. The issue with both of my daughter's beds is that they can be bunk beds or stand alone beds. Because they are not traditional stand alone beds, they have slats the run under the mattress and not a traditional bed frame. It means traditional bed skirts will not fit the bed. Since we bought these beds back in 2009, I have wanted to make bed skirts. Again…I'm really quick like that! LOL! It only took 6 years, but I finally made a bed skirt. Yay! Now if you have a traditional bed, you can easily modify what I am going to show you to work for your bed or you can use my same method and apply your Velcro to your bed frame. Start by measuring the length of your bed. Measure all of the sides for which you need a bed skirt. Also measure the height that you need for your bed skirt (14.25″ for me). If you are making this bed skirt for a traditional bed frame, add a 1″ seam allowance to your height to allow for sewing to the fabric. My bed only needs 2 sides covered. Most beds will need 3. 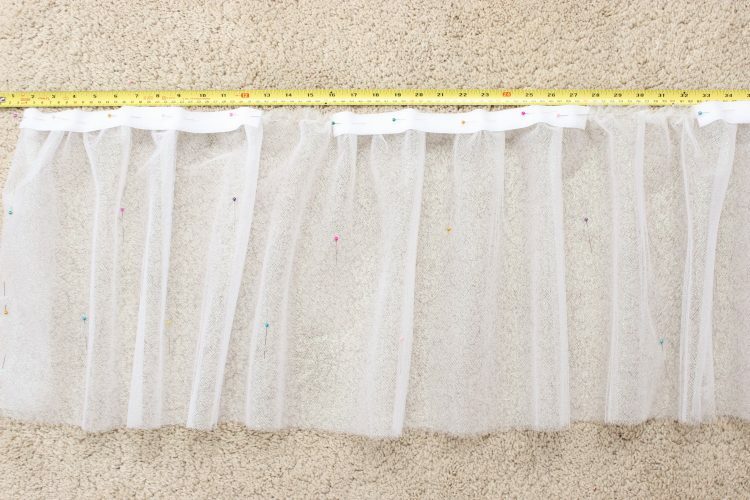 For each side, double the length of your measurement to allow for gathering and multiply that number by 4 if you want 4 layers of tulle like I used. Add up all the numbers for all the sides of your bed and divided by 36 to figure out how many yards of tulle you need. For me, my bed is 76.5″ long. Double that which is 153″. I have two sides I needed to cover which equals 306″ x 4 for all my layers = 1224″. Which divided by 36 is 34 yards of tulle. Considering how inexpensive tulle, 34 yards does not cost much. The tulle that I got from Offray is 18″ wide and comes on a roll. It was a delight to work with compared to other tulle I've worked with. I LOVED that it was on a roll! It made it so easy to just lay out what I needed. If you have ever worked with tulle before, you know how much it can easily get bunched or messed up. 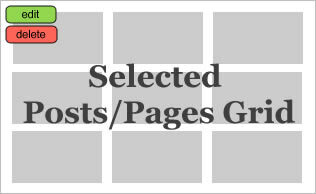 I also loved that it was only 18″ wide because it made it so much easier to deal with(though they sell the 54″ width if you prefer that). Roll out your tulle to the length you need. For me that was 153″. Roll the additional layers on top of each other, keeping the top of the tulle even(the tulle on the roll makes this super easy!). Repeat for each side that needs a bed skirt. Since this roll of tulle is 18″ and I needed my bed skirt to be 14.25″, I needed to cut off 3.75″ from the top. I measured my 3.75″ made a small cut then folded that cut over and cut from that rather than continuing to measure the full length of the tulle. It made it faster to cut and since tulle will be somewhat uneven and fluffy anyway, there was no need to make things perfect. Pin, pin, pin! As I've mentioned, tulle will easily get ruffled and messed up, so pin the layers a lot to keep them in place while working. 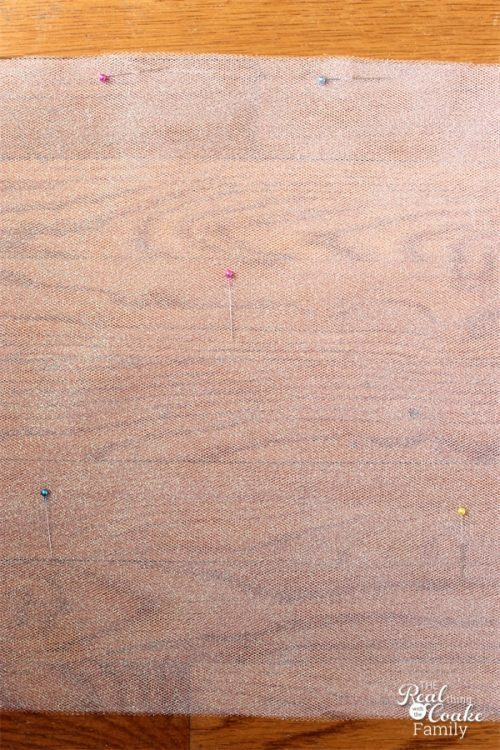 You will also need to pin at 0.5″ from the top to mark where you will need to sew your basting stitch. Sew a basting stitch (which is just a wide stitch with no back stitching) at 0.5″ from the top across the full length of tulle. Gather your tulle. (Know that with this cute sparkle tulle, you will get glitter all over you and wherever you sit as I showed you in this Instagram post.) You will do this by gently pulling on the threads you just sewed. You will find that one of the threads on both sides will allow you to pull and gather the fabric. One of the threads will be stiff and not allow you to gather. Don't pull on that one. You will need some time and patience for this process. It is not hard, but you need to work gently so as to not break the thread you are using to gather. Check for your final length as you gather. You want to stop when the tulle is the correct length. For me that was 76.5″. If you are making a bed skirt for a traditional bed frame, you will want to place your 3 pieces of gathered tulle around 3 sides of plain white fabric that is cut to the size of the top of your bed frame. 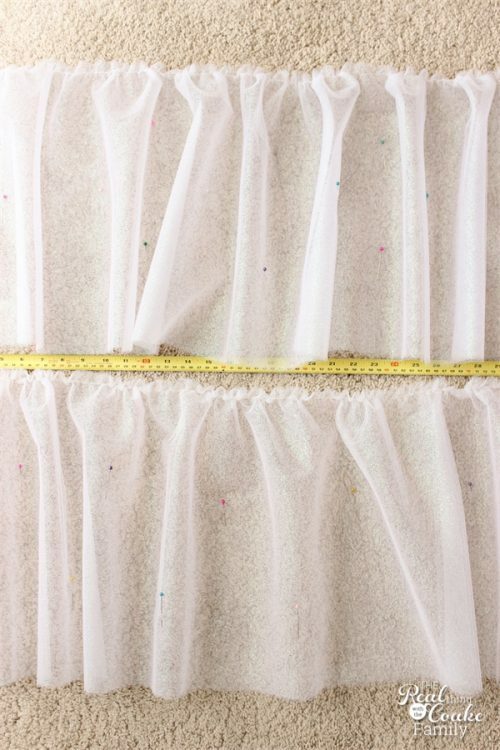 Pin and sew the tulle to the fabric using a 1″ seam allowance.
? I had no idea, but I was searching for a solution and found this. 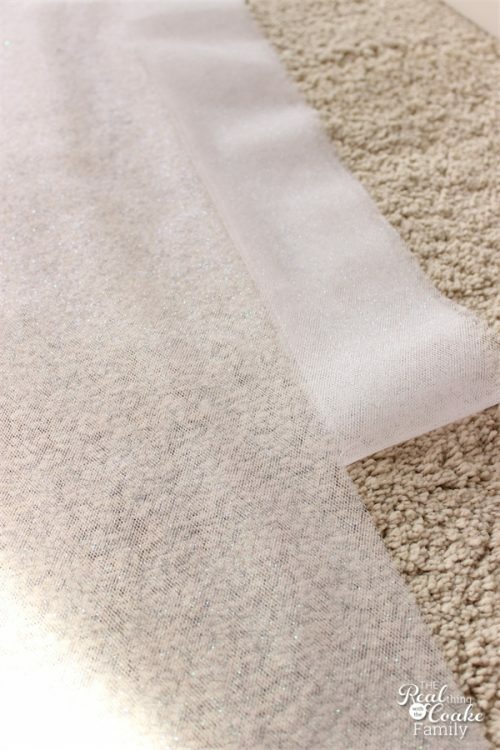 The softer side of the Velcro is sewable and the bumpy side is adhesive. It is just what I needed. Sew your softer side of Velcro to your gathered tulle. I cut mine into approximate 1 foot lengths and used 5 of those on my 76.5″ skirt. Be mindful of your tulle and gathers as you sew. It could be easy for the gathering you did to bunch up or get stuck together in this process. Just take a little extra time to make sure the gathers stay like you pinned them. Now to install the bed skirt. 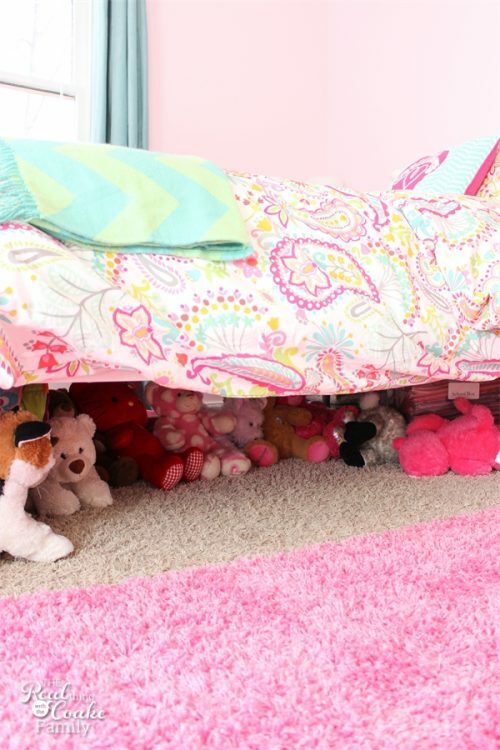 First I had to deal with the mountain of stuffed animals my daughter has stored under her bed (and refuses to part with ANY). This is what the bed looks like underneath. I have rails with a 1″ piece of wood. I cleaned the 1″ piece of wood with rubbing alcohol and allowed that to dry completely. The home decor Velcro directions say to adhere it firmly and not move it for 24 hours to allow it to cure. I attached the bumpy side of the Velcro to the soft side that I had sewed to the tulle bed skirt. I removed the strip on the adhesive portion of the Velcro and adhered it to the bed. It worked perfectly(and was impossible to photograph in that tight space with the tulle…or maybe my claustrophobia had just had enough)! 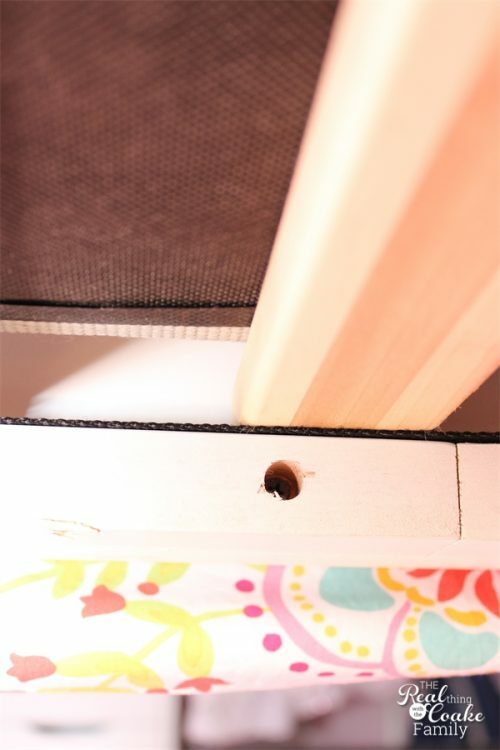 If you don't mind putting holes in your furniture or you are not as prone to change things as I am, you could use a staple gun and adhere your bed skirt that way. I get the hibbie jibbies when I feel like I can't easily change something, so the home decor Velcro is perfect for me. 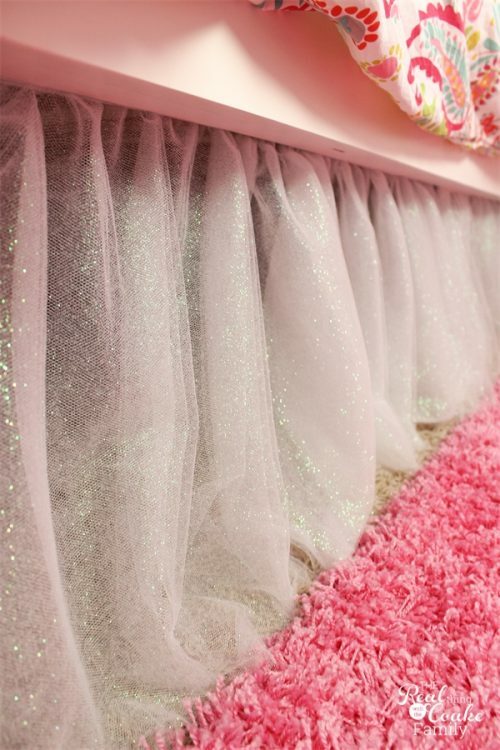 I can't begin to tell you how pretty this bed skirt is and how much it sparkles! It is so pretty. Most of all my daughter is very happy with the look. I'm super proud of myself that after 6 years, I finally made a bed skirt for one of these beds! I never really look around for ideas before I get started. I guess it takes too much time and I just want to do what I have in mind, but I looked around a little bit tonight and I've seen some other people doing skirts like this but starting with a plain store-bought skirt and sewing the ruffle to that. It gives an opaque look to the bed skirt. So, if you want your bed skirt to be opaque, try that. I, of course, wanted to save money AND we like this more sheer look. One project done in a list of quite a few to still be completed in my daughter's new room. We now have a bed skirt! 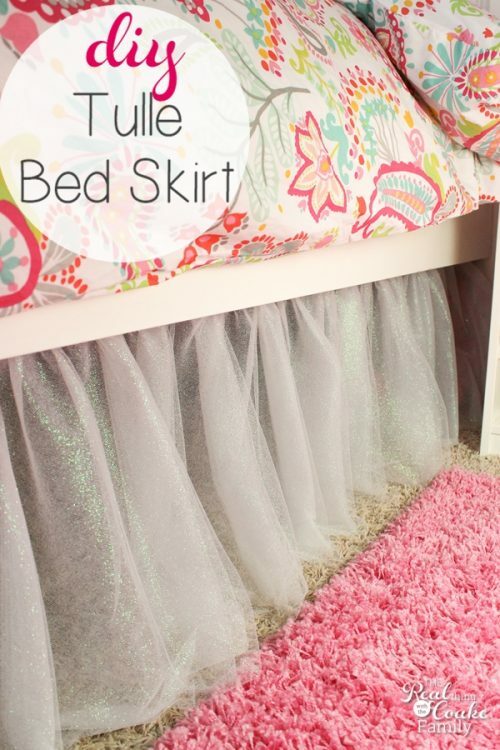 and it is a cute, sparkly bed skirt perfect for a new teen's room. A little bit grown up with a little bit of whimsy. I'll have more projects in her room for you later in the month…as I get them completed. Next I'm planning to work on some wall art and a pillow for her bed. Little by little I will get it done and save for decorating Pumpkin's room as well, so that probably by the time I'm done with the projects in Snowflake's room, I will have enough and be ready to start on Pumpkin's room. I have a wooden bed frame as well and could use a bed skirt to finish off my bed. Thank you for the tutorial! Yay! I’m so glad you like it and that it is helpful! Have fun! I think you did an amazing job, I going to be making a bed skirt for my grandson’s – guest bedroom. It’s a king size bed and very tall. I don’t want to spend alot of money because I like change. Thanks for the Velcro tip. 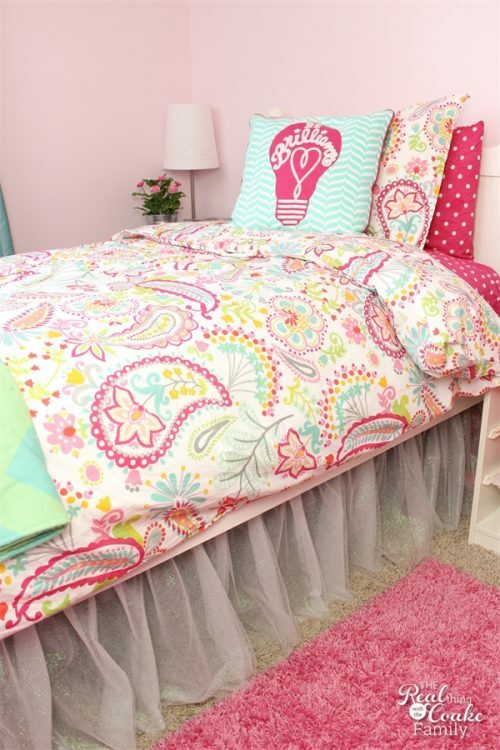 Where did you get your daughters comforter set? We got it from Pottery Barn Teen. It was a little bit of splurge, but if you sign up for their emails, you can usually find a time when they are offering some deals.